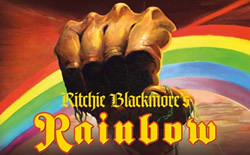 Ritchie Blackmore's Rainbow will play 4 shows in the UK in June 2017. Rainbow - "Memories in Rock - Live in Germany"
Track listing & Black Night, Perfect Straners, Spotlight Kid, Man on the Silver Mountain on You Tube. Read more: Rainbow - "Memories in Rock - Live in Germany"
I don't know if we are going to make a world tour but maybe some more dates are possible.